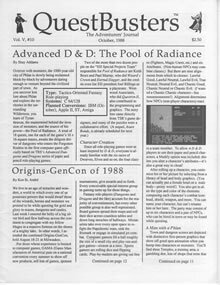 Shay Adams published this 8-16 page black and white newsletter from 1984-1996. It covered computer role playing and adventure games in depth. I remember learning of it from a postcard enclosed in either SSI's Pool of Radiance gold box game or The Bard's Tale II. I subscribed but then over the years lost or recycled all my issues (gasp). I'm slowly reacquiring them, but they are very hard to come by. A while back folks were discussing what happened to Shay. Click on an issue below to download it as PDF.